As it is our only club run annual event each year Stanthorpe to me always has that special feel as the time for the weekend approaches. This year we were blessed with the most exceptional weather, unlike the last couple of years when it has either been bitterly cold or raining or sleeting or all three at once. Saturday started off with things going pretty much to plan, my Honda seemed to be running reasonably well, Tony’s Ducati not so good but at least he was getting some track time under his belt. Racing started & in the first round of P4/5 I finished 3rd in my class, then won my first ever race in the new Historic 350 class ( I was really glad I invented this new class ). P3 competitor Graham Barker reckoned I blocked him from passing me several times during the race but if he only knew how short sighted I was he’d know I wouldn’t have seen him coming anyway. He left me with the words “next time Dave, next time”. Sounds like the words from a movie but I just can’t place them. You have probably heard the term “hero to zero” because not long after I finished crowing about my inaugural victory I started the second round of P4/5 & things didn’t go quite to plan. I missed the start badly, Rusty Pierini got away from me so I was chasing hard cursing myself for letting him get away. Round the track into the last corner leading onto the main straight & my front brakes failed. Off the track, onto the dirt & face planted in front of the tyre barrier. Dirt, busted bike bits & pride spread out for all to see. I did eventually fix the front brakes to a degree with Rusty’s help but then my brake master cylinder sprung a leak “again” so I called it quits after an easy “brake testing” run on the Sunday morning. 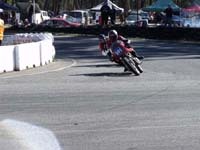 Tony continued to have problems with the Ducati but he did manage more track time them I did over the two days. Unfortunately I was not the only one to suffer mishaps over the weekend, Rusty bit the bitumen on the same corner, poor Russell Bentley seized his Bully during practice on Saturday morning, Ray Clacher & Bruce Russell also had spills. Luckily no one was seriously hurt & you know what they say about bike racing, “if you don’t fall off occasionally you ain’t going hard enough”. I did manage a couple of runs with my old sidecar buddy Ted Hayes on Sunday morning which brought back a lot of great memories & as I have always said “is the best fun you can have with your pants on”. 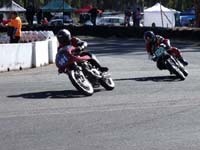 A couple of highlights over the weekend for me was watching the Wacker boys go at it on their Supermoto "chook chasers". 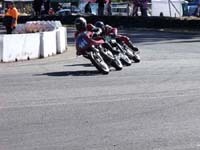 I know they are not Historics but it was still great fun to watch. The other was the combined race with all the Historics on Sunday afternoon. It was fantastic to see so many on the track at once & from a couple of reports the competitors enjoyed the experience. We might make it an annual event, call it the “Historic Survivors race” for all those that can keep their machines running & “upright” for the weekend.